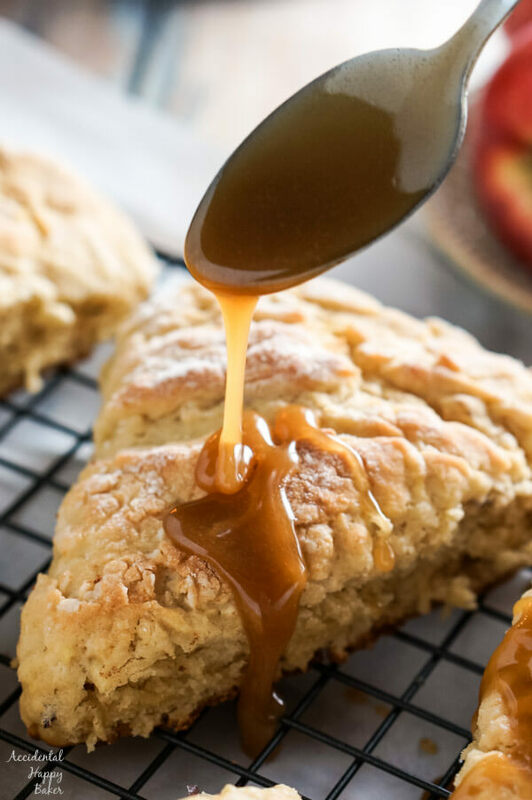 Caramel apple scones are flaky tender scones studded with chunks of sweet tart apple that are topped with buttery homemade caramel glaze. It’s okay to have a crush on these scones, I have for a long time. I know I just posted an apple recipe not that long ago. 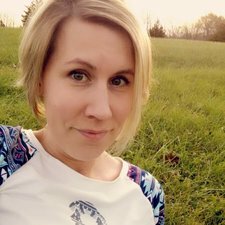 Let me tell you what happens; I buy apples to eat fresh, they are my good intention apples, but then I think of things to bake with them and it all goes out the window. Apples are my gateway drug. I should be embarrassed to admit this, but several years ago before I started blogging I kept a list of things that I wanted to eat on my phone. I’m a habitual list maker. Basically this first list was just a list of different types of scones I wanted to make and eat, because if you couldn’t tell from my Let’s Get Sconed board on Pinterest, I’m slightly obsessed. This scone list should have provided an inkling of what the future was going to hold for me. I mean, it can’t be normal. Most people don’t keep lists of scone flavor combinations on their phones. 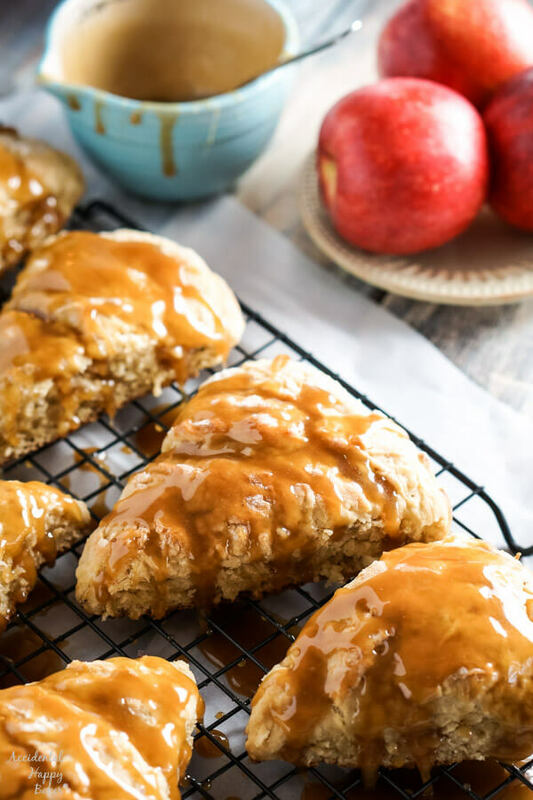 Anyway, at the top of my scone crush list was caramel apple scones. I have made these scones so many times since they went on the sconelist and I love them so much. 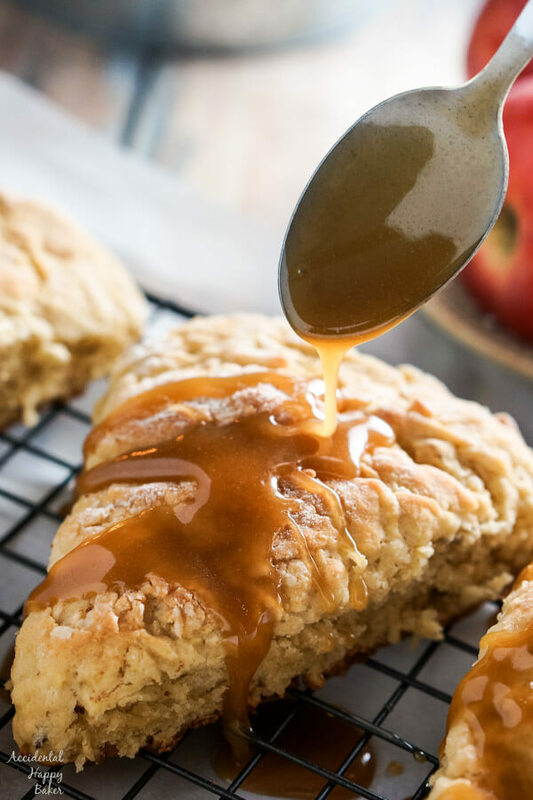 How can you not love fluffy tender scones studded with chunks of sweet tart apple that are topped with buttery homemade caramel glaze? This glaze, my gosh. I could eat it with a spoon. (When I say I could, I mean I have.) Now, I think that most scones go perfectly with a cup of tea, but a caramel apple scone and a cup of tea that is just like true love forever. It’s a pairing that will never go out of style and will always be delicious and feel indulgent in my book. A note about choosing apples for this recipe. In my mini apple tarts, apple upside down gingerbread, and the apple bacon cheese muffins I just posted the other week you’ll find I wholeheartedly recommend gala apples. But not with this recipe. 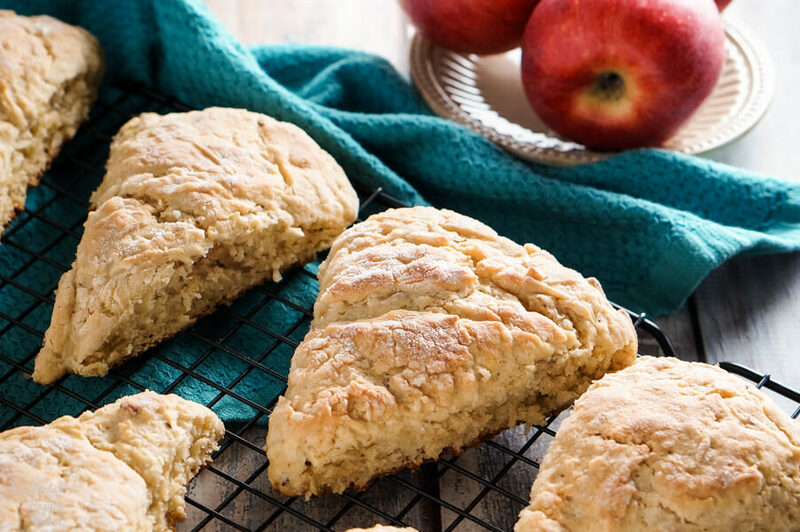 For these scones I recommend a Jonathan or a Granny Smith apple and I’m going to tell you why. To really get that characteristic sweet, but tart caramel apple flavor I think a more tart apple works better to enhance that combination. If you are using up the apples you have on hand, feel free to use whatever baking apples you have. 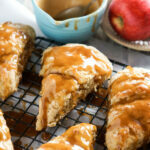 But if you’re going out and buying apples specifically to make these scones, these are what I’d recommend you pick up. 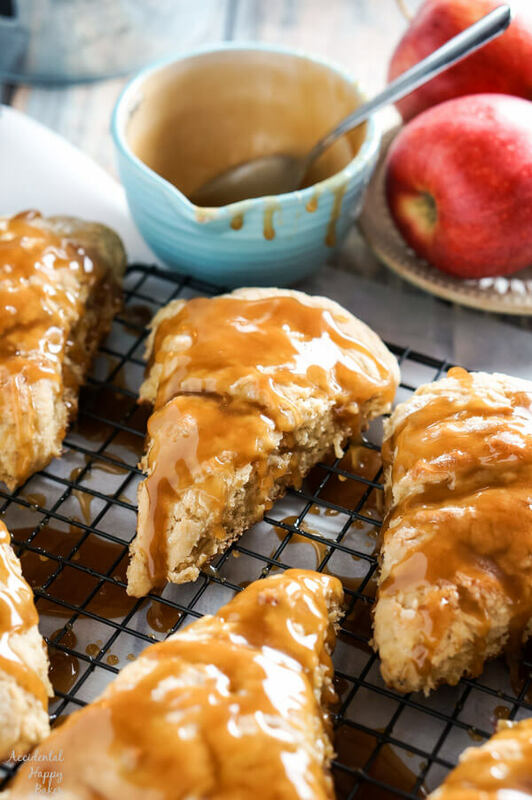 Caramel apple scones are flaky tender scones studded with chunks of sweet tart apple that are topped with buttery homemade caramel glaze. Preheat the oven to 400 degrees and prepare a baking sheet with a nonstick silicone baking mat or parchment paper. In a medium sized mixing bowl, add the flour, baking powder, salt, and brown sugar. Stir to combine. Cut the cold butter into small pieces and add the to the flour mixture. Using a pastry blender or your fingers, cut the butter into the flour mixture until the mixture is coarse and crumbly with no pieces of butter left larger than pea sized. Add to this mixture the chopped apple, buttermilk, egg and vanilla. Stir until the liquids are completely incorporated and the mixture begins to come together into a dough. Lightly sprinkle flour onto the counter and turn the dough out, kneading it lightly a couple times. Shape the dough into a 9 inch round and place on the baking sheet. Using a sharp knife, cut the dough into 8 wedges. Separate the scones slightly. To prepare the caramel glaze, heat the sugar, butter, and milk in a small saucepan until the mixture comes to a boil. Boil for one minute and then remove from the heat and stir in the vanilla. Allow the glaze to sit for a few minutes to cool and thicken up. Once the scones have cooled and the glaze is cool enough that it won't burn you, drizzle the glaze over the tops of the scones. These scones are the best the day that they are made, though they will keep for 2-3 days in an airtight container. The glaze will harden up and lose it's shine the longer the scones sit.